newbuu2 on Ora! Ora! Ora! Orararararararara! Traverse the Ulvenwald to replace either Attune with Aether or Lay of the Land. Rith's Grove to replace Selesnya Guildgate. Nature's Claim to replace Naturalize. Is Scour from Existence your only way to exile a Hedron Alignment? 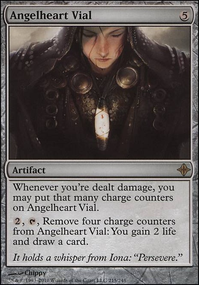 I would suggest adding Anguished Unmaking, Ironwright's Cleansing or Angelic Purge, they're much quicker and cheaper forms of removal and help with the exiling. 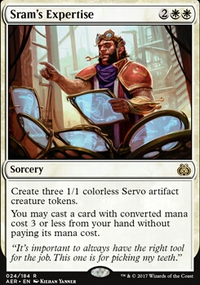 I know you can use Diabolic Tutor to find Scour from Existence but that's atleast 2 turns where you haven't affected the board at all. Declaration in Stone might not be bad either and in this meta maybe sideboard Fragmentize or Ironwright's Cleansing incase you come up on some heavy artifact stuff. Fumigate is good against overwhelming aggro as well. Scour is probably far too expensive. Transgress the Mind is the cheapest way to do it in Black or Blue, but with the downside of having to reveal your hand. You can also counter your own spell with Void Shatter to exile it, but that's on the expensive side as well, especially since it uses a spell that would be better used on your opponent but that's true of both of these things. Adding in White gives you some more options. 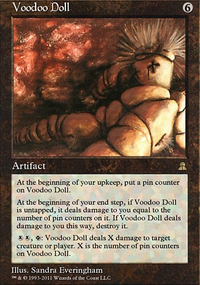 Angelic Purge, but with a "downside" of having to sacrifice a permanent BUT you could sacrifice another Alignment to get it in to your graveyard. 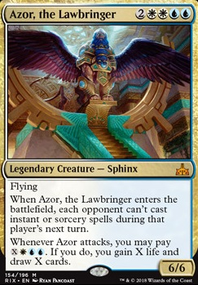 There's also Ironwright's Cleansing.Adding in White AND Red gives you Nahiri, the Harbinger who can get it in to your graveyard AND in to exile with her first and second abilities respectively. Adding in Green would give you access to World Breaker, which at the same price of Scour gives you a 5/7 body on top of it. Just gunna run down the changes I'd make. Cut 4 Shamble Back, it's narrow and will likely be a dead card most of the time. Cut Graf Harvest, you don't run almost any creatures and giving menace isn't super relevant as a control deck. Cut Mind's Dilation, it's really expensive and there are better finishers. Move Peace of Mind to the side, it's bad outside of aggro match ups. Move Ironwright's Cleansing to the side, bad if they run no artifacts/enchantments so it'll be dead a good chunk of the time. 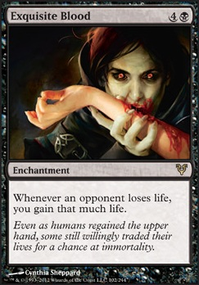 Cut 2 Macabre Waltz, you don't play many creatures so it'll be dead a lot. Cut Slip Through Space, same reasoning as before. Cut Hanweir Militia Captain Flip, you run very few creatures so it'll almost never flip. Cut Odric, Lunarch Marshal, you have literally only one creature that it can share abilities on. Cut Cathar's Shield, you don't have many creatures and there are more powerful things you can do than +0/+3. Land count should probably be closer to 25-26.